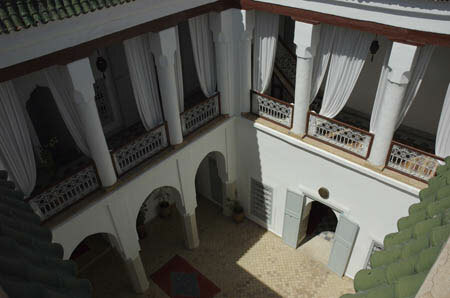 Arriving at the riad you leave the exciting bustle of the Medina and enter a stunning discreet and private tranquillity. Built on three floors around an open courtyard, this generously appointed house, (sleeps 12-14 in 6 double bedrooms), is perfectly suited to the discerning traveller wishing to discover Marrakech, the family looking for a lavish home from home, or a group of friends looking for an exciting location for that special occasion. About Us | Links | Contact us | Log in | Entries (RSS) | Comments (RSS) 53 queries. 0.611 seconds.